I See! Thanks much for the pictures, they're incredibly helpful. Hi H�kan, great explanation & great photo's & great skills! All demonstrated in one fantastic posting! You make it look all so easy,but I know it's not. Yes ... WOW ... impressive craftsmanship and what Greg said! Many many thanks Guys! It has been a to and fro work in six months now and felt a little overwhealming at times but is over the top now and its downhill now. I'm happy you like it and I'll show more progress pictures as it comes along. My thought was to mill Arbour's frame enough to take brass bushings for the drive wheel axles. What do you think? This is what I'll first thought to do but I had nurtured the idea for the suspension for some time and realized there was no space for the hornblocks and springs in the original frame. But with some work I think the the frame can be used. On mine the slots looks like they had been milled but they were not parallell so milling and some brass bushings would fix it. Hi All, I have been a bit absent on the modeling as well as the forum fronts as there has been a lot to do at work. I have not built anything on the Arbour 4-4-0 since the last post as I'm waiting for some parts from NWSL to be able to continue. Meanwhile I have completed 3 stock car kits from Alkem scale models that have been on the waiting list for some time. I have painted and weathered quite heavily(for me at least ). The history is that they were bought second hand from the Pennsylvania R.R. 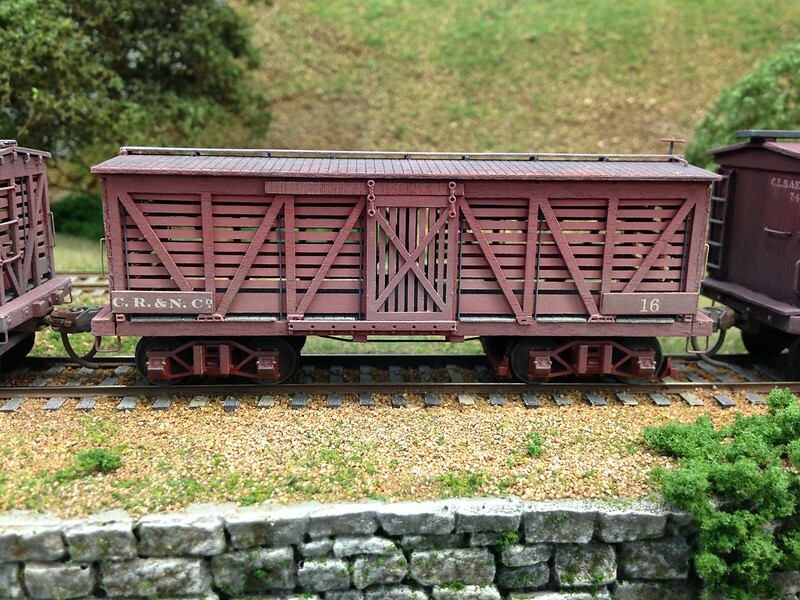 I have tried to weather these so they look well used with about a 5-7 years since they were last repainted. To give them the impression also of age and that they have been reworked over time I have given them different trucks. 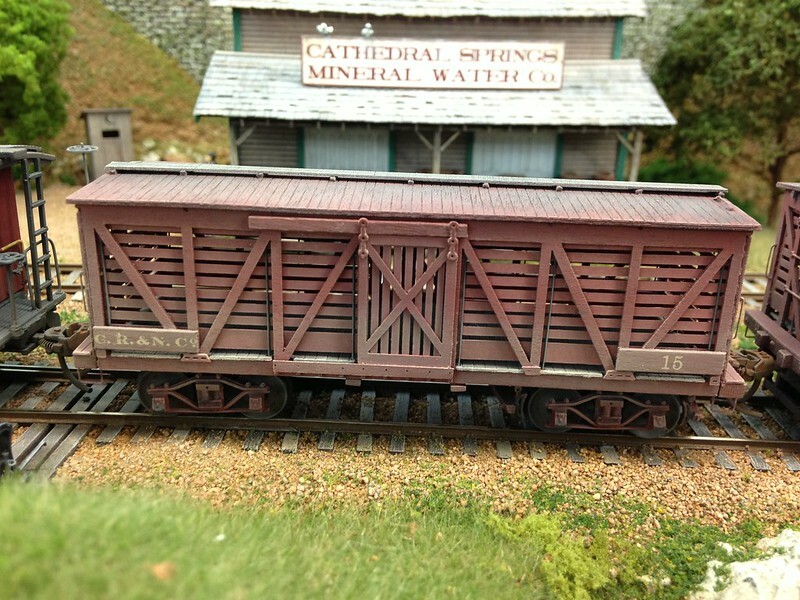 I have kept the original wood beam trucks that came with the kit on one of them and substituted one with trucks from Rio Grande models and the last one with trucks from Panamint models (3D printed). There also have been some progress on my 19th century tourist trap. 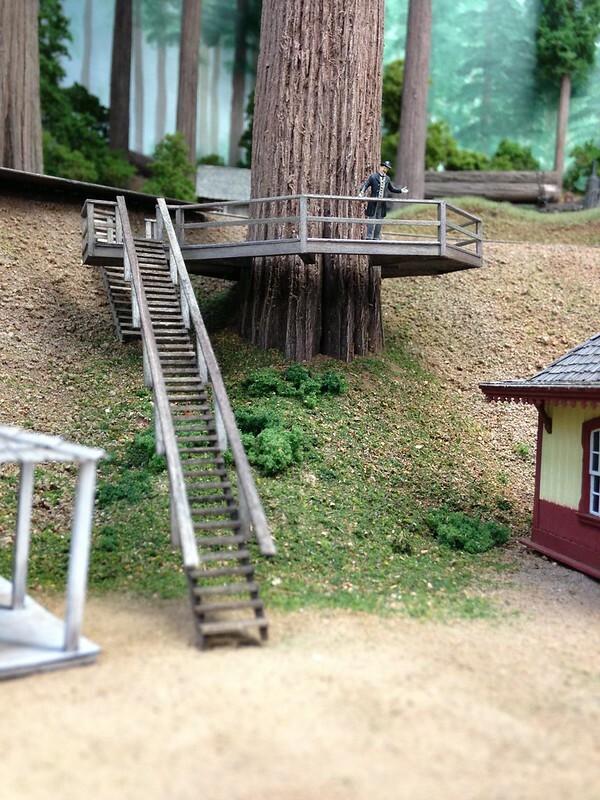 I have enclosed some photos of the platform around the Redwood tree trunk arranged with the stairs and the rail platform. The lowest stair as well as the platforms will be supported by some hefty timbers. Last I have enclosed a 3D model picture showing a Jackson & Sharp 6-wheel passenger trucks from the 1880s that I have worked on to and fro the last year. I have used Google SketchUp to draw them and I'm now eagerly waiting for them to be printed at Shapeways. The plates on the right are inserts to convert a Kadee wheelset to Allen paper wheels. It has been great fun drawing them and hopefully now I have the courage to tackle the passenger car that will ride on them. Hi H�kan, your posting came just in time! I was just about to draw my last C.R.&N.Co. breath! And it's a good thing that I managed to hang on, by the looks of your latest update. The newly acquired but formerly owned P.R.R. stock cars look like they been around for a bit. And will continue to do so, under their new ownership. The new stairs and platform look really cool! And also help to show off the scale of the giant redwood tree. And those Jackson & sharp 6 wheel passenger trucks that you have drawn up,and working on are the cherry on top! Now just keep things a roll'in here,I don't need anymore near C.N.& N.Co. death experiences again! It's not in its death throes just yet, that will probably be in the 1930s with the woods cut out and losing traffic to trucks. The depression is far, far ahead in time and everyone can still enjoy the booming and Bonanzas for many years to come. I hope I'm not tiring you all with my posts? It feels sometimes as it is only me and Bob who use this Early rail forum and post here . Would be great to see more from other members here as there must be some great Early rail modeling going on that I'm for sure would like to see? Well I thought I would show two comparison photos on the layout progress. My layout is not big though and it is only 12' that is nearing completion. During the time here on the forum it feels like I have learned a lot from all the fantastic modeling here, interaction and diversity here on the RLF. 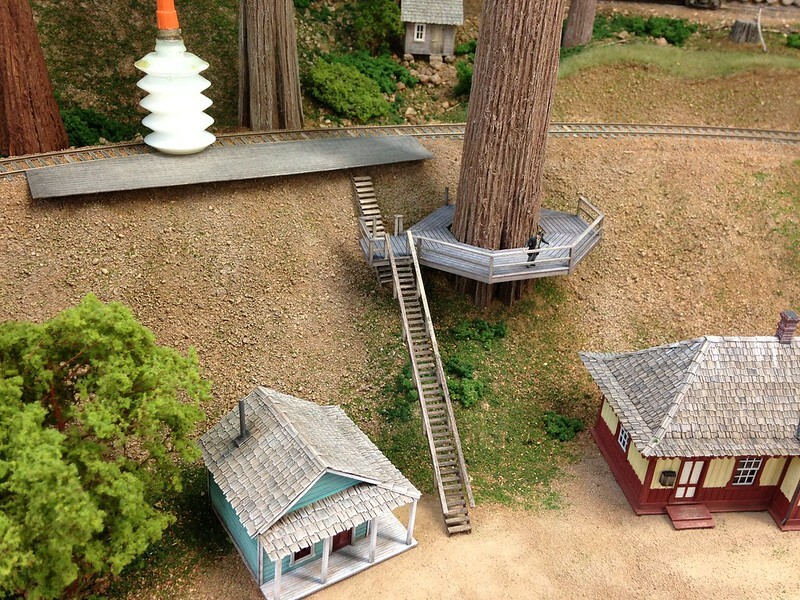 For example if I hadn't found Jos thread on tree making I would probably never had made the Redwood grove area. Next is to get going also with more track laying on the lower parts as it is now I can't run the whole length of the layout. If I could get the lower yard a little more complete I could try (hopefully with some modeling friends) to try some rudimentary operation to see how things are working. One thing I'm regretting making the layout is my turnouts which what I now would have wanted to be stub switches. But I have invested too much time in the ones I have and most of them are now firmly in place. 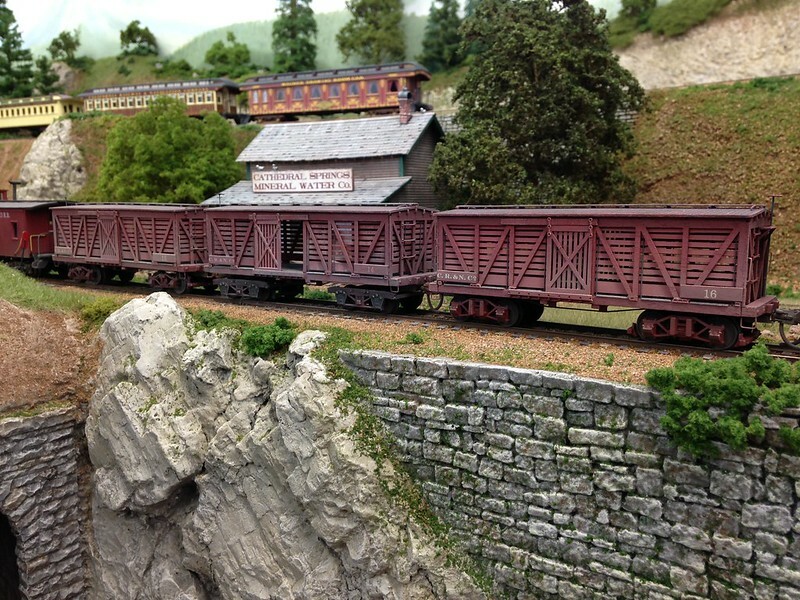 Hi H�kan,well your photo's sure show the great progress that you have made with your amazing layout! The overhead valance really helps to frame all of this fantastic work you have achieved so far. And the good news is, it will only get better as you progress my friend! Thank goodness for this forums, that allows you to share your work with the rest of us all around the world. By the way...that is a very beautiful sailing ship that you showed us on the other thread. I am sorry to read,that you had to give her up!Well maybe not,you now get to spend more time on your layout. Which is a great thing, for us !!! Hi H�kan, everything is looking excellent. look forward to seeing how it comes out. I too wish we could induce other early rail modelers to post here. There is not to many of us who are building a layout and have more than a dozen pieces of equipment, about 10 total I think. Two have their own web pages so we won't see them. I've advertised this forum over on the Yahoo groups but still it is just you and I. You did an excellent job on the stock cars. I used the same kit my cars. I'll post how I modified them in my tread. Where did you post the sailing ship? I think your layout is fantastic! I appreciate that you guys are keeping early rail going! I don't have a layout, and only build structures, but I always want something to make my stuff older(earlier) than the last. Please don't feel like you are alone-perhaps the category "Early Rail" may give some the wrong impression-so they don't look at it. I also believe that the topic title also steers people toward or away from checking it out. It's hard to decide what to say! So many nice changes to the layout ... new equipment, scenery, "tourist trap" and all look wonderful. Bump in from time to time, great work done H�kan, keep it coming !! I thank you for that Greg! Shiver me timbers! Aye a ship she is although a tiny one . Well one can�t be active in everything so I had to let her go. She was the fourth wooden boat I have had so I had got a bit tired of all the varnishing and scraping. 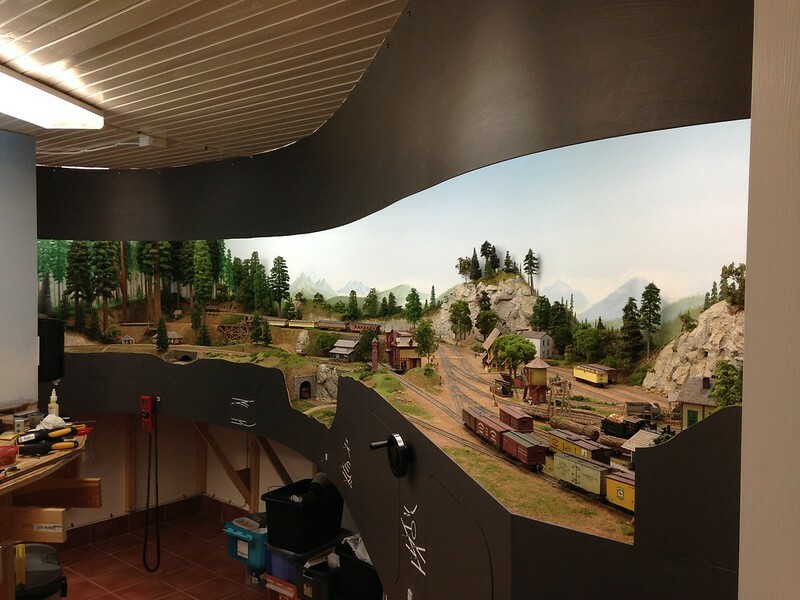 Much more fun to do model railroading. Thanks Bob, the truck I�m very excited about. I hope they will be made and in my mailbox soon. I think I saw your cars on the Earlyrail Yahoo forum when I was looking around. They looked absolutely great! Would be great to see what you did to modify them. 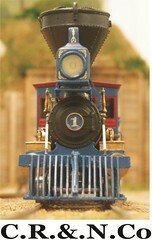 The trucks looks like Rio Grande model ones? Many thanks Carl! That about the manufacturers sure is true. 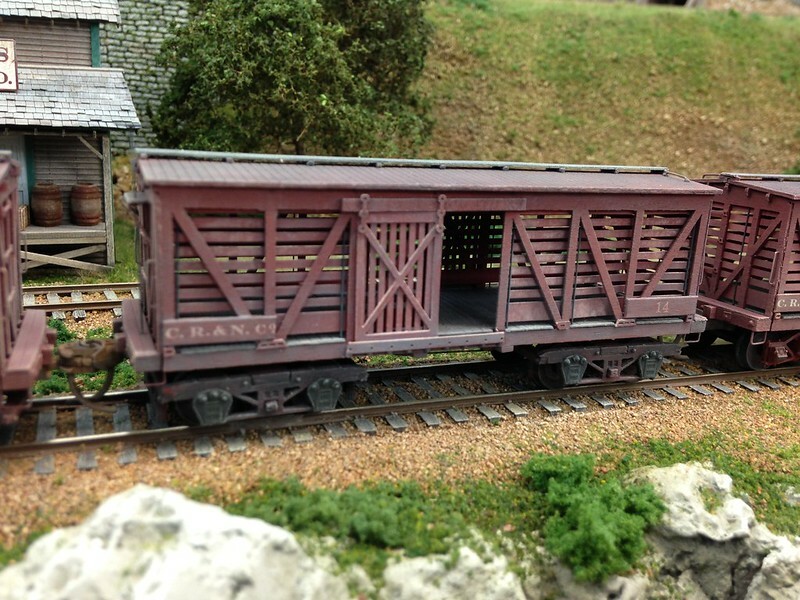 Although there is a lot of stuff available for example BTS, Alkem, Rio Grande in the rolling stock area. But in the motive power area things are really lacking. 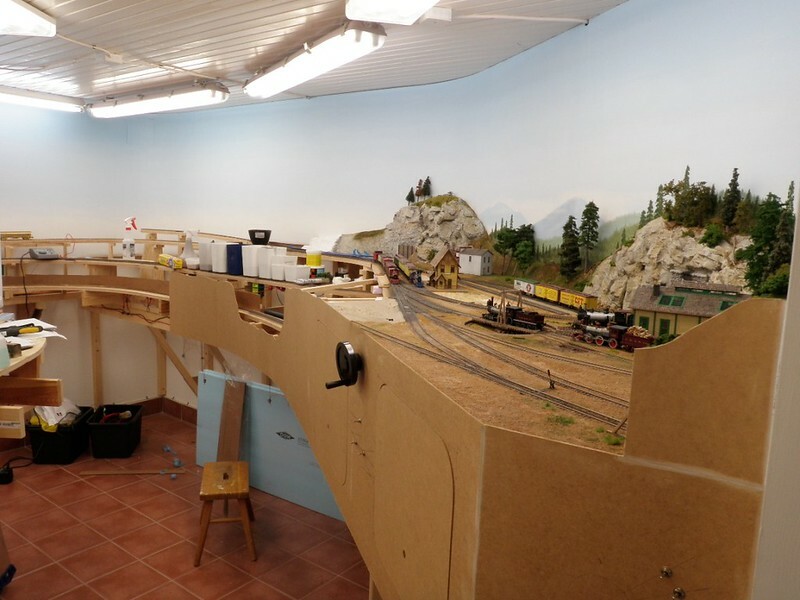 But the lack of stuff is a little of the fun with it that it is not as easy to get things for the layout and one have to make a lot of scratchbuilding. So many craftsman kits to do and so little time, sigh. I guess your right about the forum title. Thanks Martin. I have missed your On30 thread, I guess you�re busy with the museum layout build which by the way looks great.